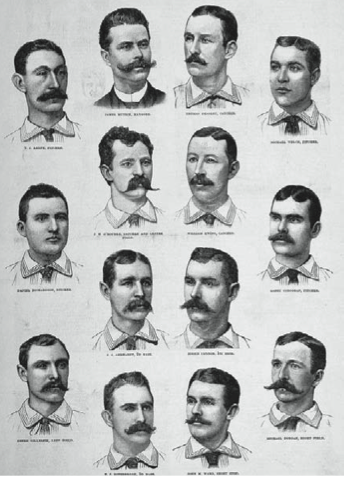 The 1885 National League pennant race was a battle between two dominating teams, the Chicago White Stockings and the New York Giants. Neither team ever lost more than two games in a row from Opening Day all the way through September. When these juggernauts met with two weeks left in the season, they both had astounding winning percentages, Chicago at .798 (83–21) and New York at .779 (81–23). All four games of the eagerly anticipated final series were sold out in advance, an unprecedented occurrence. Although the games were played in Chicago, the Giants had every reason to be confident of gaining ground and at least tying the race. After all, they had won nine of the 12 previous head-to-head matchups. Moreover, they had won seven of the eight games that White Stockings ace John Clarkson had pitched against them, while their own ace, Mickey Welch, was a perfect 7–0 against Chicago. The series took place at the White Stockings’ new West Side Park, a narrow horseshoe of a field with short foul lines and high fences. At least the lines were not as short as at the team’s previous yard, which had yielded an inordinate number of home runs in 1884. The sellout crowds were variously reported in the papers as between 8,000 and 11,000 each, but team attendance ledgers put the actual crowds between 6,657 and 6,908. For the opening game, Tuesday, September 29, White Stockings captain Adrian Anson chose Jim McCormick to pitch for Chicago, while New York sent Welch to the pitcher’s box. With fans sitting in foul territory and standees stringing out down the outfield fences, Giants captain John M. Ward insisted on ground rules giving three bases on hits into the overflow. He quickly regretted this as Chicago used two-out triples into the crowd by Fred Pfeffer and Ned Williamson to build a four-run first inning. Chicago catcher Mike Kelly added three groundrule triples and finished with a 5-for-5 day, while pitcher McCormick hit a triple of his own and held the Giants to just six singles. The White Stockings won, 7–4, finally beating Welch, and increasing their lead to three games with seven to play. The next day the Giants insisted on a cleared outfield. The crowd was shoehorned into every nook and cranny of the grandstand, and there were fanatics sitting in foul territory. They witnessed the tensest battle of the year. Chicago’s battery was Clarkson and Silver Flint, New York’s was Tim Keefe and Buck Ewing. Clarkson walked two in the first inning, but he picked Jim O’Rourke off first base, and Roger Connor was doubled off after a line drive was caught. In the Chicago first, Abner Dalrymple and George Gore were both caught trying to steal second base. The home team finally broke the scoreless tie in the last half of the fourth inning. Dalrymple sent a hot grounder to left and sprinted around to second just ahead of Pete Gillespie’s throw. Gore followed with a hot grounder of his own that shot through shortstop John Ward and allowed Dalrymple to score an earned run. Gore moved to second on a passed ball, but the next three men flied out. Keefe then ran this string of men retired to 11 before Pfeffer stepped into one and sent a beauty over the cozy right-field fence with two out in the seventh inning. The score remained 2–0 until the ninth. Connor opened with a walk. Ewing struck out. Gillespie reached base when first baseman Anson muffed a throw. With two on, Mike Dorgan bounced to shortstop Tommy Burns, who tossed to Pfeffer to force the runner. Pfeffer’s desperate attempt to complete a game-ending double play went wild, and before the dust cleared, Connor had scored and Dorgan was perched on second with the potential tying run. But Clarkson snagged Danny Richardson’s come-backer, tossing it to Anson for the final out. Clarkson had won, 2–1, on a three-hitter despite six fielding errors by his teammates. It was his 53rd and final win of the season. The third game was played on Thursday, October 1. New York’s 42-game winner, Welch, lost to Mc- Cormick again, this time 8–3. A two-out error by Ward prolonged the Chicago second inning, then second baseman Joe Gerhardt let another grounder go through him and two men scored. With Chicago runners on second and third and two out in the fourth, Ewing let a passed ball get by for one run and then threw wildly past third to give the White Stockings two more gift tallies. New York counted one in the third and two in the sixth, all thanks to errors and passed balls, and the score stood at 4–3 before Chicago put the game away with four clean hits in a four-run top of the ninth. Dalrymple finished with three hits, Burns scored three runs, and McCormick tossed a three-hitter. Leading the race by five games with five to play, the White Stockings aimed to mathematically clinch the championship in the series finale on Saturday, October 3, with Clarkson pitching against Keefe. Paced by a three-run poke over the left-field fence by Kelly, they roared out to an 8–2 lead after three innings. But the Giants showed their mettle by tallying one in the fourth, two in the fifth, and (aided by a controversial call at second base) five in the sixth to take a 10–8 lead. When they added two runs in the approaching darkness in the bottom of the eighth, the game was called. The pennant was officially decided on Tuesday, when the White Stockings beat the Phillies and the Giants lost to the St. Louis Maroons. After clinching the race, the White Stockings relaxed and finished the season with their only three-game losing streak of the year and an 87–25 record, two games ahead of New York. Chicago’s final .777 winning percentage has not been matched in all the years since.